Simplifying your home and life can be such a rewarding experience. You end up having more time for the things you really want to do and have to spend less time cleaning, organizing straightening, etc. I have been on a minimalism/simplifying journey for 5 years and I am so glad that I discovered it. It has really changed so much of our lives for the good. We have more time to spend with each other. We can do more things as a family and overall our stress has gone way down. I have used many different resources over the years on my journey to more simple living. Websites, books, and blog posts have all helped me tremendously to continue on this path and learn better how I want to live. 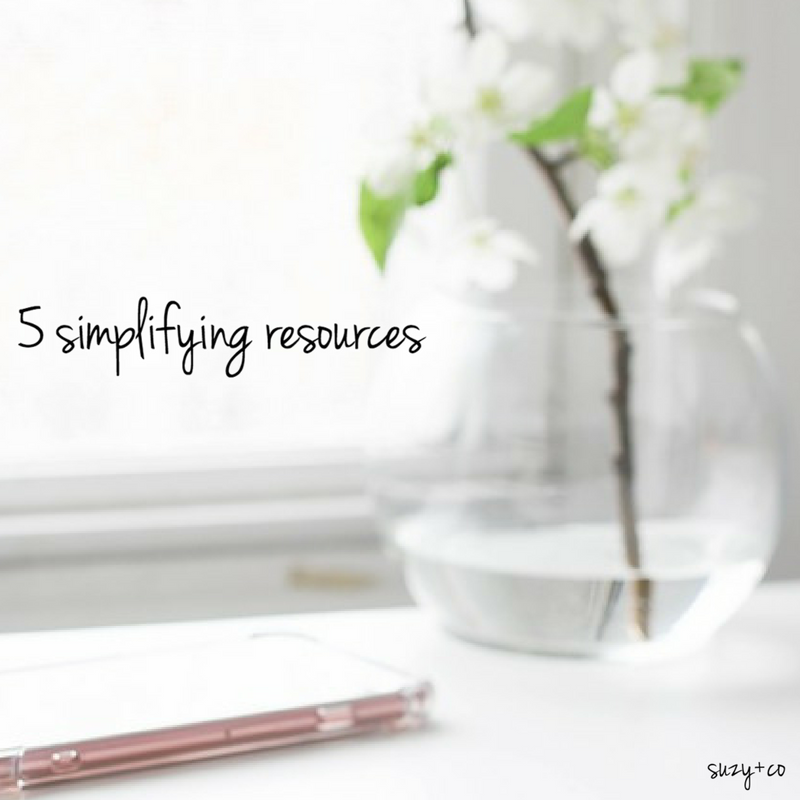 The following is a list of my top 5 favorite simplifying resources at the moment. I highly recommend all these sources and these are what I use personally, not just what I have heard about. 1. Becoming Minimalist - This was the blog that started it all for me. Even before the Marie Kondo book came out, I discovered this blog and poured through every article. It really opened my eyes to how much stuff we were keeping and how much time I would spend cleaning and organizing. After finding this blog I was so ridiculously inspired. That first year I got rid of 1000s of items. 2. Zen habits - This was a blog I followed sporadically until very recently. And then I made a conscious effort to go back through more of the archives. I am so glad I did. There are so so many inspirational gems and articles. One that hit home for me recently was how simplifying your life isn't always a one and done. There are times where you will need to revisit your home and life and reevaluate what serves a purpose for you and what doesn't. After 5 years I was starting to feel like my house should be pretty set and my minimalism journey should be done, but although I have made tons of progress, there are seasons in life where you once again need to declutter. He has been around a long long time so you really will never run out of good simplifying content. About a year into my journey I heard about this book and decided to give it a read. It actually was life changing. I know that term is cliche and gets thrown around all the time, but in this case, for me, it was true. Even though I had been decluttering and minimizing for a year, this book really helped me see how much I was still holding on to just-in-case. Maybe I would need it in a year. At the time I was also struggling with getting rid of sentimental items. There was a lot of guilt associated with getting rid of them. I felt bad and was very worried about what the gift-giver would think. But her book helped me realize that it is okay to get rid of sentimental items. There is even a part of her book where she talks about thanking items out loud. I thought it was absolutely ridiculous, until I was really having a hard time parting with some items and thought I would try the whole thanking thing. And you know, it totally worked! I felt silly at first, but seeing that it worked made me continue to do it and it helped me over that hump that I was stuck at. I love love love instagram. It is my favorite social media platform. I think because it is simple. You post pictures with captions and then like and comment on others. Although they are coming out with more features and I hope they don't complicate it, as for now I still find it to be a simple platform with not too much going on. If you are on instagram you can follow just hashtags. I follow a few on minimalism and find them very inspiring and motivating. On my own Instagram account https://www.instagram.com/suzyandco/ I share tons of stuff on simple living, simple recipes, being present, slowing down, and living naturally. 5. The One Thing - This is a fantastic book that I do not think gets talked about enough. The author really shows how focusing on one thing vs multitasking is best. We often are so busy and have too many things on our plate that we either cannot get everything done, or we cannot do everything well. This book inspired me to do less better. To put less on my to do list but be consistent more, follow-through, and focus on the most important things that would help both my business and help me inspire others. I often reread or relisten to it throughout the year and is still one of my top favorite business books. Whether you are just starting out with minimalism and simplifying, or have been in it for several years, I know you can benefit from the resources above and live a life of simplicity and intention.